If you want to bake an easy dessert; but still want to impress your guests. 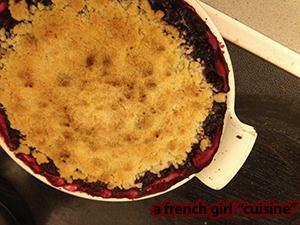 Try this Mixed Berries Crumble recipe. Spread butter in a pie plate and place the mixed berries. Mix the flour and white sugar in a bowl. Add it to the flour and sugar and with your finger carefully mix the butter until it looks like breadcrumbs. Spread the mix on the top of the fruits and bake the crumble around 25 – 35 minutes.